Have fun playing in the outdoors with our range of Coloured Zinc Sticks. They are a fun and colourful way to protect yourself from the Australian sun! 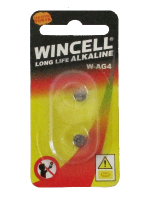 Wincell Brand - For High Drain Devices, High grade, Coin, Lithium for Diaries, Games, etc. Sunsational sunscreen lotion provides you with broad spectrum 50+ protection for all skin types from the suns harmful rays.